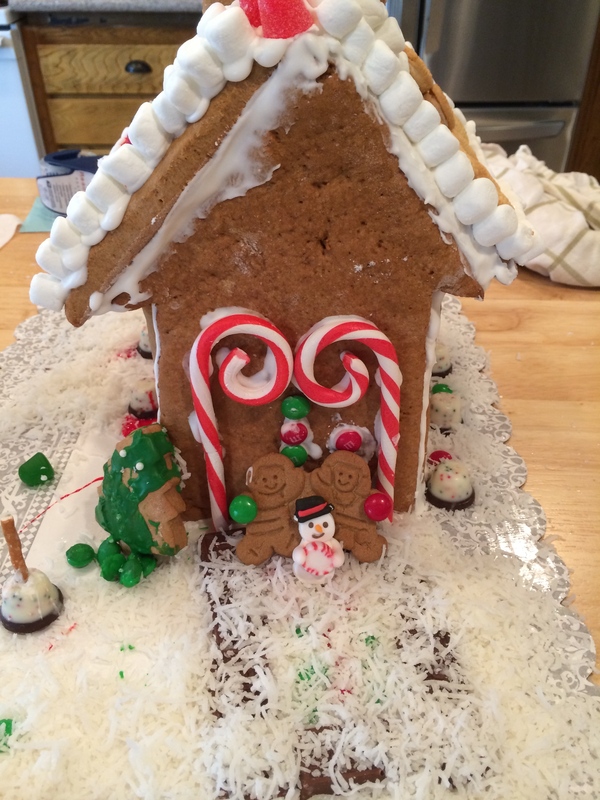 It has been many years since I made a gingerbread house from scratch. 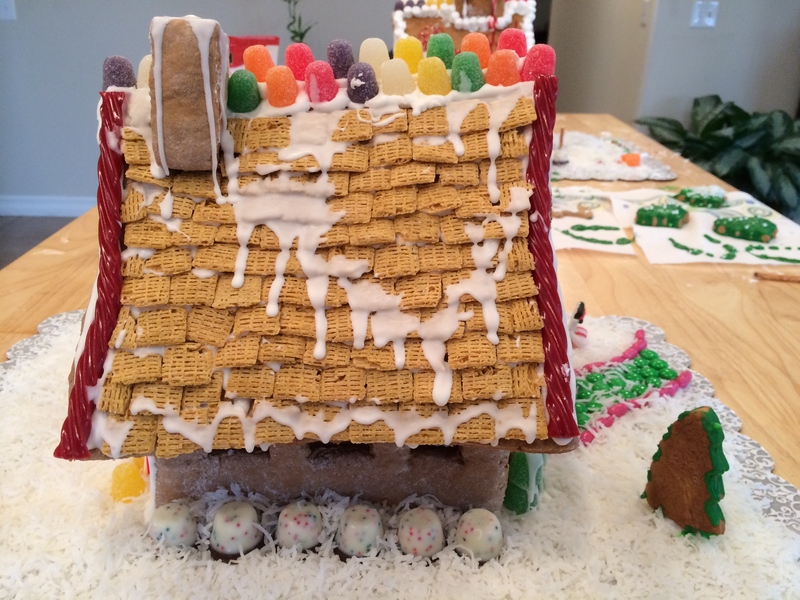 I have a vague memory of doing this as a kid, and in between I did one from a kit that had pre made house pieces and awful tasting royal icing. 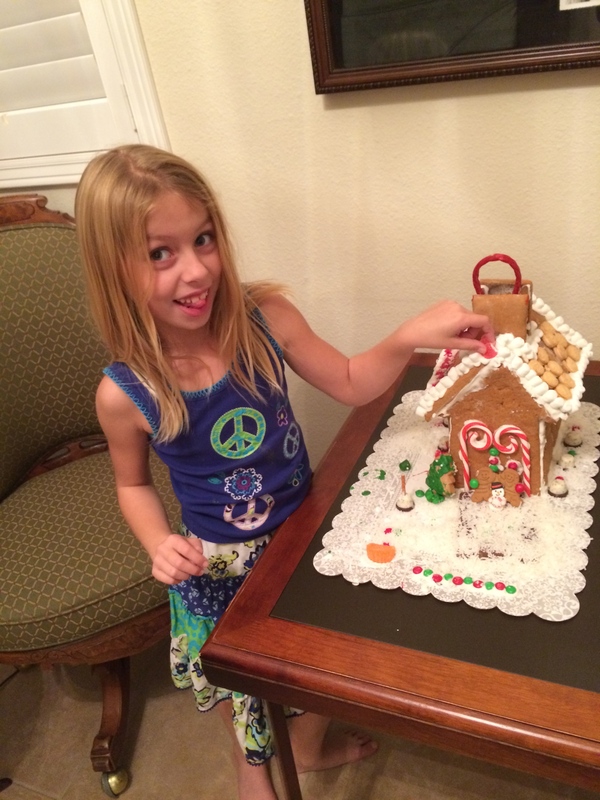 I had a whim this week that it might be fun to make a gingerbread house with Melody, so here we go! I downloaded some instructions from King Arthur Flour (click the link, it is packed with info!). 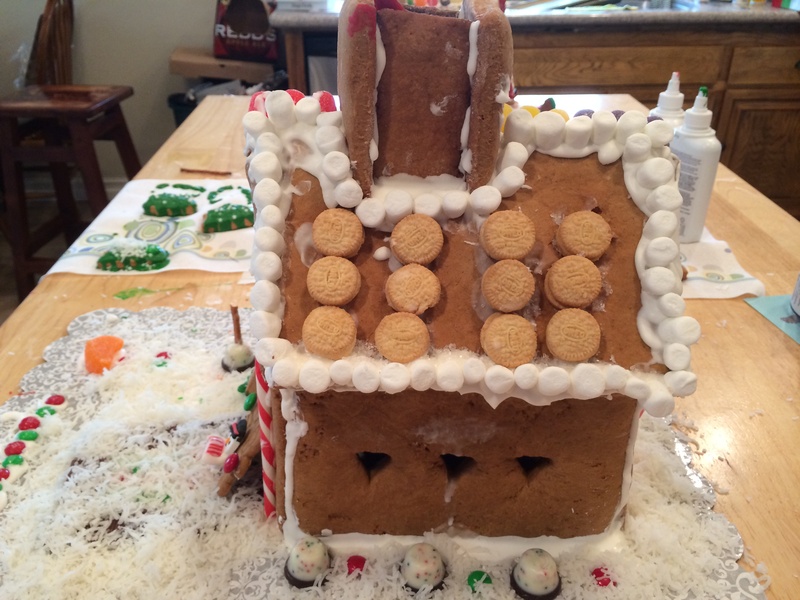 The gingerbread recipe was easy to follow, if a bit bland. I had hoped for a more gingery gingerbread. Next time I’ll stick with my mother’s or grandmother’s recipe. The first batch was so dry I had to add a bit of milk just to get the final dry clumps to bind with the rest of the dough. The second batch was insanely sticky. Go figure, I used the exact measurements and measuring cups for each recipe. ??? I chilled it for an hour, then with my sister’s words of wisdom ringing in my head, I floured the heck out of my work surface, plopped down some dough, floured it again, and then floured it some more for good measure! The dough when chilled was stretchy and rubbery. I had a hard time rolling it thin enough, but did have enough left over to make some trees, elves and a Santa Claus cut out. 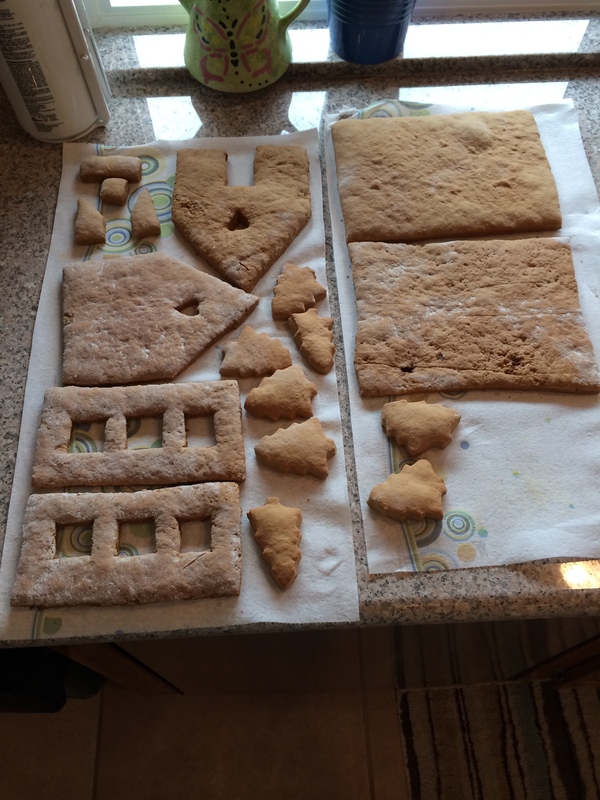 Instead of square windows on Melody’s house, we used a small heart cookie cutter. Awww, it was pretty cute. 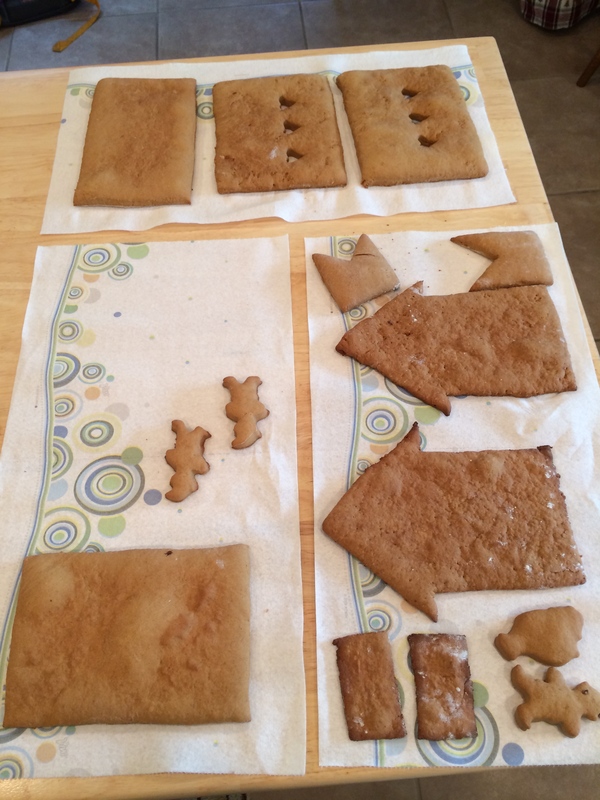 :-) We allowed the gingerbread pieces to cool quite a long time before assembly. In the meantime I made royal icing. The key to good royal icing is beating it a long time, not quite to merengue state, but close. You want it thick so it doesn’t drip right off or run. I used a plastic zipper type bag in a gallon size as my pastry bag, and snipped off one corner. It worked great! The freezer weight bags are quite durable. 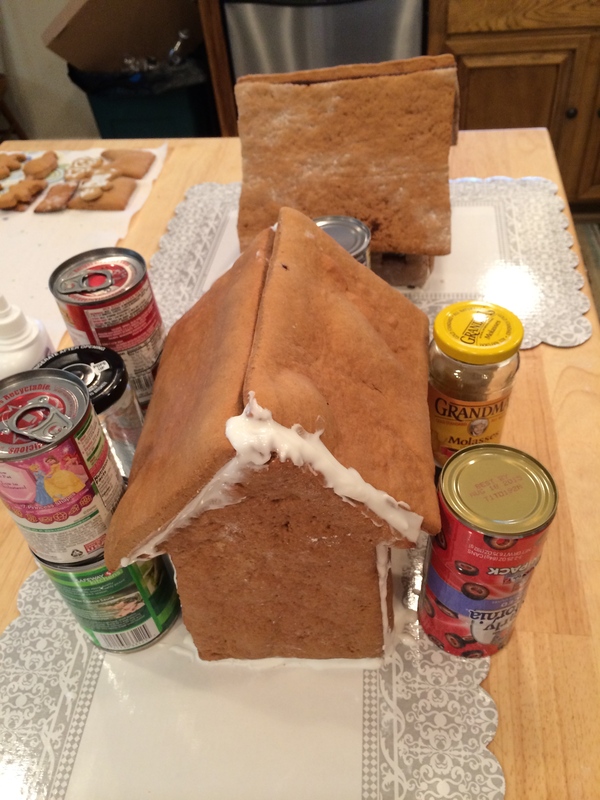 Don’t you use canned goods to make your gingerbread houses? I piped a bead on the bottom edge of the wall and stood it up, then did the same with the next wall, all the way through four walls. How did I get them to stay up you ask? Well I used cans to prop them up heh. Even though the royal icing was nice and thick, gravity is stronger haha. We left these to set overnight, then put on the roof pieces in the morning. Here we ran into trouble. On the Pixie House, one front wall was actually curved, and one roof piece was too short. Not sure how that happened since I used the same pattern piece to cut them both. I also have not figured out how to make the gingerbread bake flat. Ours was ripply and lumpy. Hrmm. we used the can technique to set the roof pieces and watched some TV for an hour. Finally, we went to town decorating. I got a little crazy buying candy for this escapade because I didn’t know exactly what we would want. I like to have lots of choices! We had Twizzlers, M-n-M’s, Skittles, gum drops, Dots, peppermints, bell shaped chocolates, candy canes in two sizes, plus stick pretzels and mini Oreos. Oops! But, it paid off and we have really colorful houses! One last note about the templates. 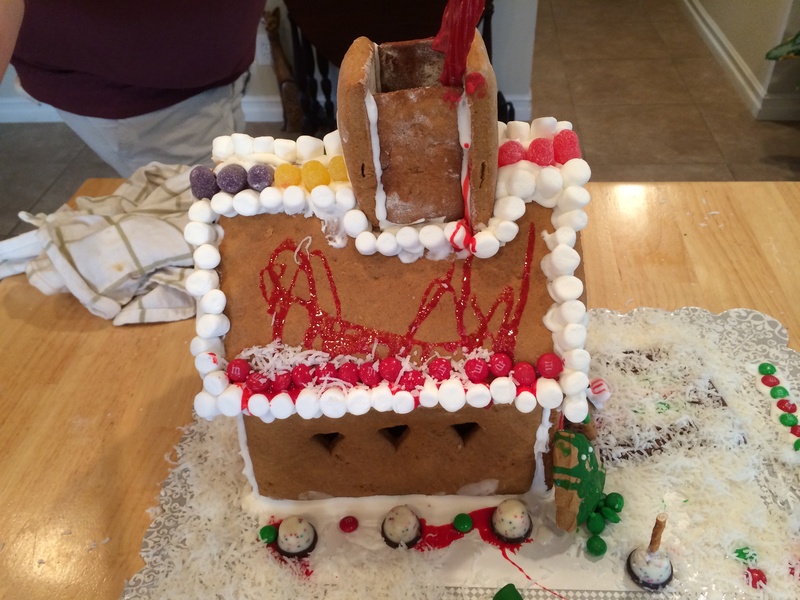 The chimney on the King Arthur house left something to be desired. But the chimney for the Pixie House was very nice and sits very sturdily on top of the house. 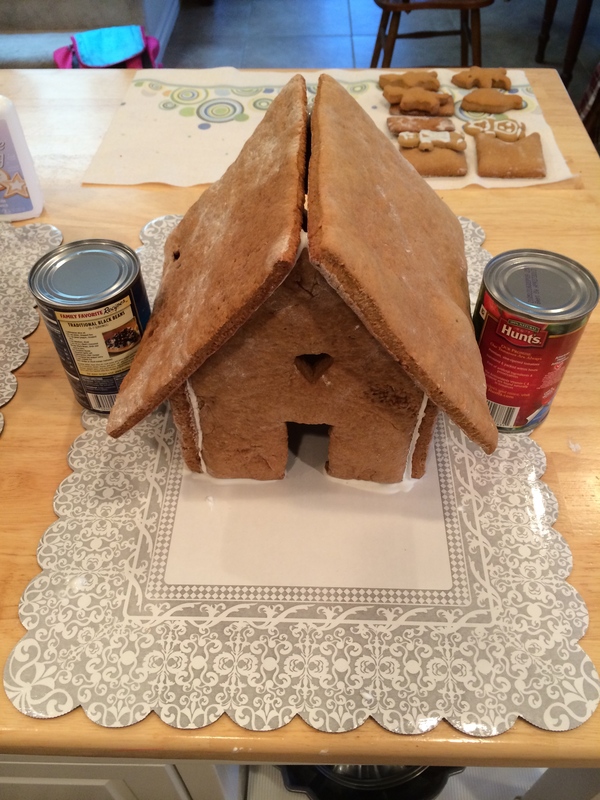 A combination of the two house templates might work if you have the right roof pitch for the “good” chimney to work. Hey! I forgot to cut out the front door opening! 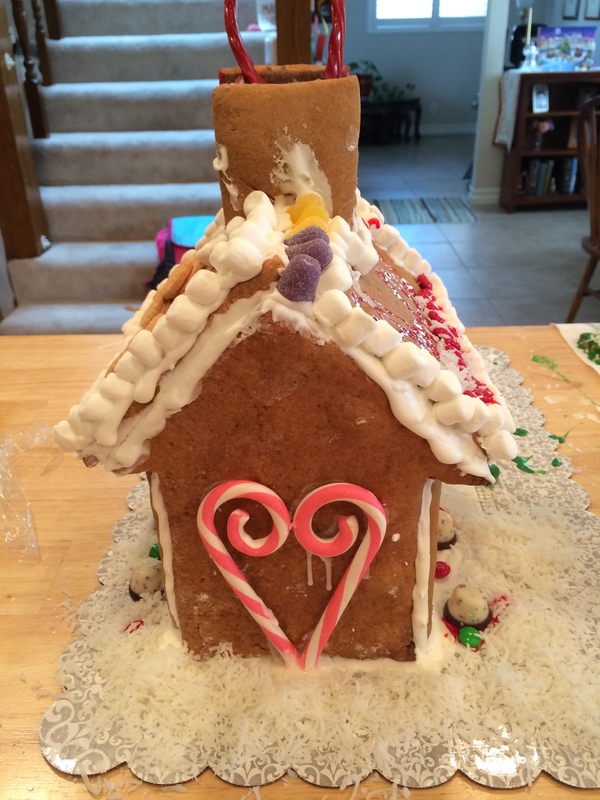 This was a really fun activity but I think in the future I will only make one house. 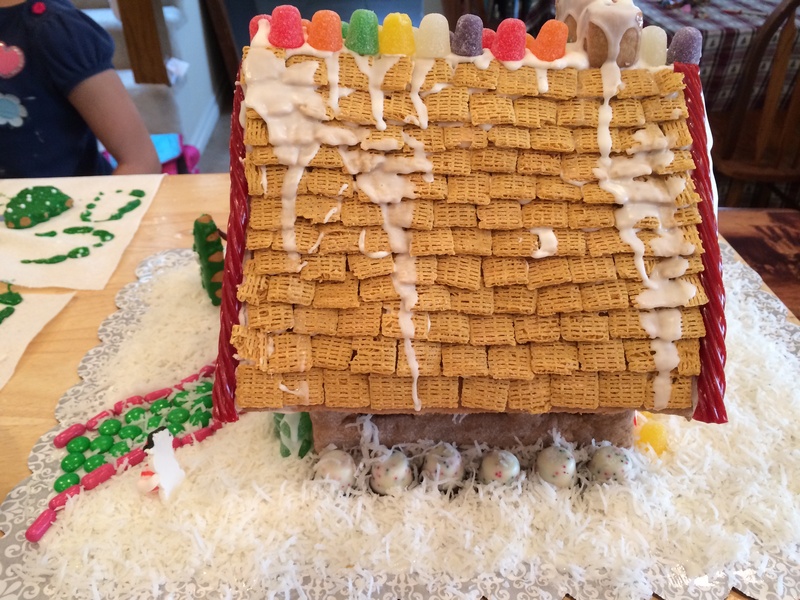 I’m glad we both had a house to decorate because we had very different ideas of what should be included and of course different levels of talent. But if we do this next year, Melody will decorate the house and we will enjoy it however she decides to do it! As I mentioned a while back in the month, I will be sticking to one resolution per month this year, and January’s resolution was to try new food. Specifically, I resolved to try something new each week. I would not say that I am not an adventurous eater, but I can’t try things that just sound inherently dangerous or outright gross. So puffer fish and chocoate covered ants were just out. This was a bit of a cheat for me because I had voluntarily tried brussel sprouts within the first week of the month, before I put together my resolutions for the year, but I hope you will just forget that. Each week I considered what my food adventure would be. I did not limit myself to just produce – although that is where my failings lie – but I did try a bit of this and a bit of that. Week 1 – Brussel Sprouts – brush with a bit of olive oil and roast; I will try these again. Week 2 – Cinnamon Chicken – ever since I saw a Little House on the Prarie episode where Laura switched out the cinnamon for cayenne pepper before Nellie Olson made cinnamon chicken for Almanzo Wilder, I have wanted to try this dish. I posted on Facebook for food ideas and my friend Brianna sent me the recipe. It was quite good! More savory than sweet because there is no sugar. I served it with brown rice and green beans and it was a nice change to our regular fare of “chicken something” and veggies. It takes two tablespoons of cinnamon, so poor Almanzo having to politely eat chicken with two tablespoons of cayenne pepper on it!! Week 3 – Pineapple Melon – I have seen these in the grocery store and wondered about them. Since it was something I doubted I would ever try unless under duress, I purchased one and Melody and I tried it a day or so later. This thing is seedy and around the seeds is a gelantanous goo. This wasn’t looking good. I pried out a small piece and put it in my mouth…and immediately spat it out! This thing is horrid! I can only liken this fruit to the consistency of the inside of a tomato (and you all know how I feel about THAT) and bitter, sour, unpleasant. Yuck! Melody tasted a bit and enjoyed pulling the seeds out more than eating it. I threw the whole thing in the trash and shudder when I recall the taste. 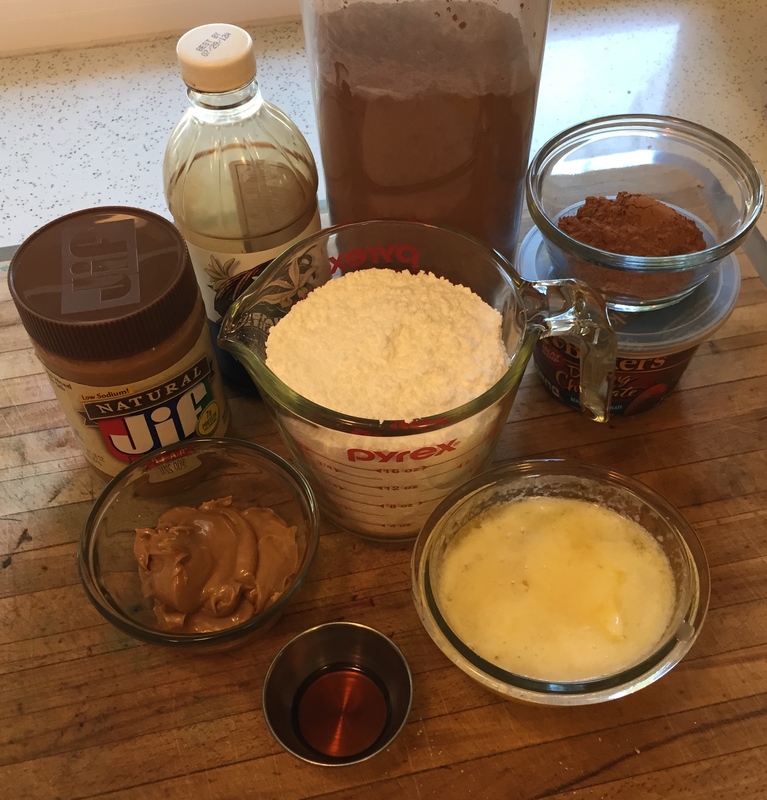 Week 4 – Graham Cracker Cake – In an attempt to redeem my tasting tribulation of the previous week, I made a vintage recipe called graham cracker cake, except I didn’t have graham crackers, so I crushed Nilla Wafers. This cake was very good though I think I might have not baked it long enough. It acted a bit like a sponge or angel cake at first, but soon fell while it was cooling. The recipe card didn’t indicate how long to bake it, so next time I’ll try it for longer. It’s worth a second attemp and yes, we did eat it all even if it was a bit messed up. With a bit of whipped cream, it redeemed the new foods resolution completely! I didn’t mind trying the new foods and I will continue to try to work more foods into our dietary routine. I’ve got a turnip or two in my fridge right now and I’m actively looking for preparations, plus I’ll be trying some new recipes for my sister site Gram’s Recipe Box as the months progress. All in all, I’d call January’s resolution of new foods a success! I was in a magazine! Recently my friend Suzanne Broughton, who is an editor over at OC Family magazine, asked me if I would like to have one of my recipes featured in the May issue of the magazine. Well, that didn’t take long to think about and of course I said YES! It was tough trying to decide which of the many favorite recipes I would choose, but after a bit of thought I selected the brownie recipe from my Grammie Hennie. They are so easy to make it’s almost a crime, and any time I make them, there are only crumbs left in the blink of an eye. Click on the image for a larger view. Take a look at the current edition at OCFamily.com or click here to get to the May edition. 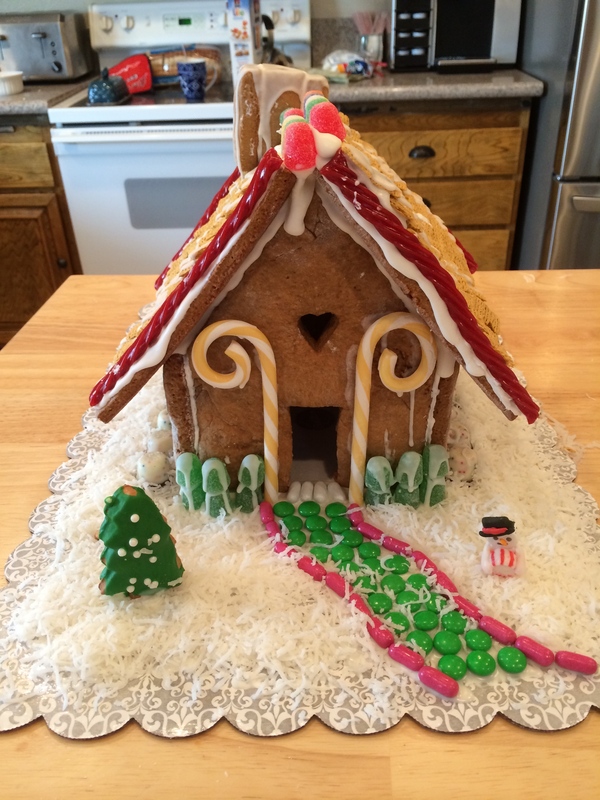 Did you – like me – fall prey to the skillful marketing folks at Wilton? They had these cookie shape pans on sale at Target, Walmart, and elsewhere. Yes I bought them. Yes I was frustrated because they didn’t carry any instructions or even tips. Yes I was downright irritated that my first batch was awful. They overflowed the shape and were uncooked in the centers. I was disgusted with the whole thing. But since I am not the type to give up easily, I tried again. So, in case you – like me – want to use these pans to spite Wilton, here are a few pointers. 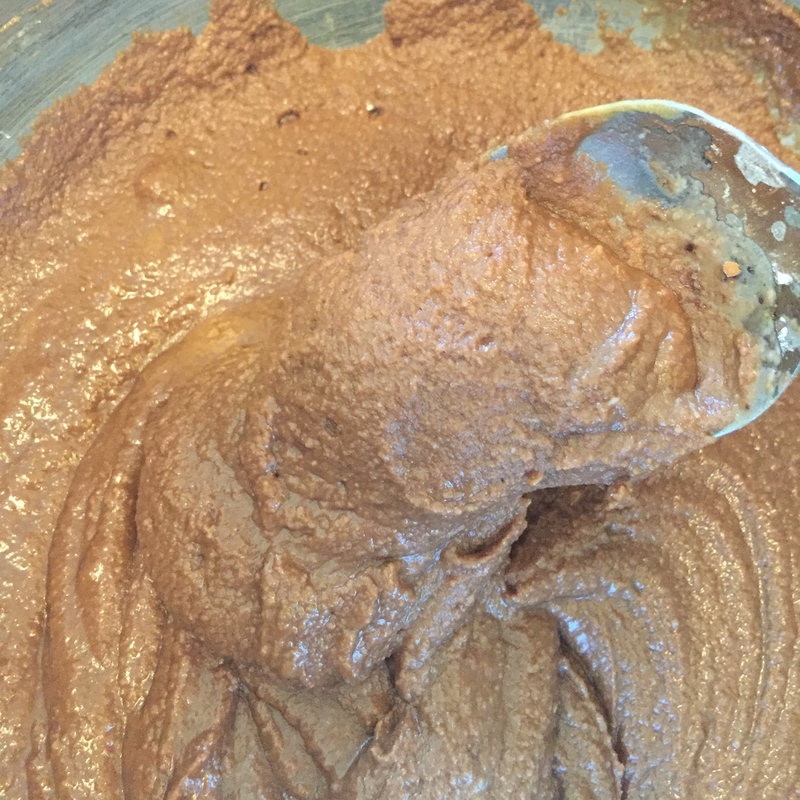 I used Pillsbury gingerbread dough, for no particular reason, just what I had on hand. The large batch of dough made about 36 cookies. Good luck! 1. bring your dough to room temperature if it’s refrigerated. 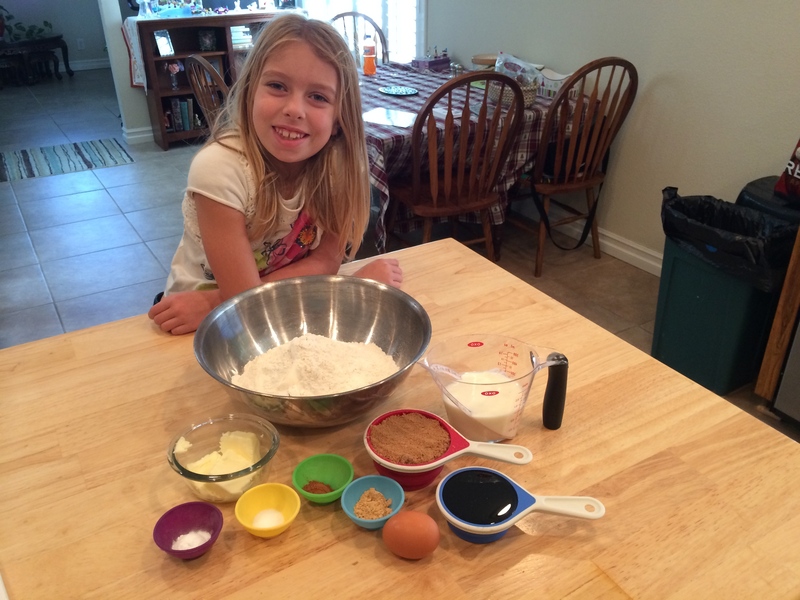 2. take a bit of dough, enough to make a 1″ ball, and make a ball. 3. press the dough ball into the center of the shape, then work outward into the nooks and crannies of the design. For the more oblong shapes, make a log out of the dough, the do the same as with the ball. 4. the dough should not fill the entire shape to the top. It needs room to expand, so fill it no more than 3/4 full. 5. bake as per your recipe’s instructions. 6. let cool 2-3 minutes after baking before trying to get them out of the pan. I had to use my fingernail to loosen the cookies. 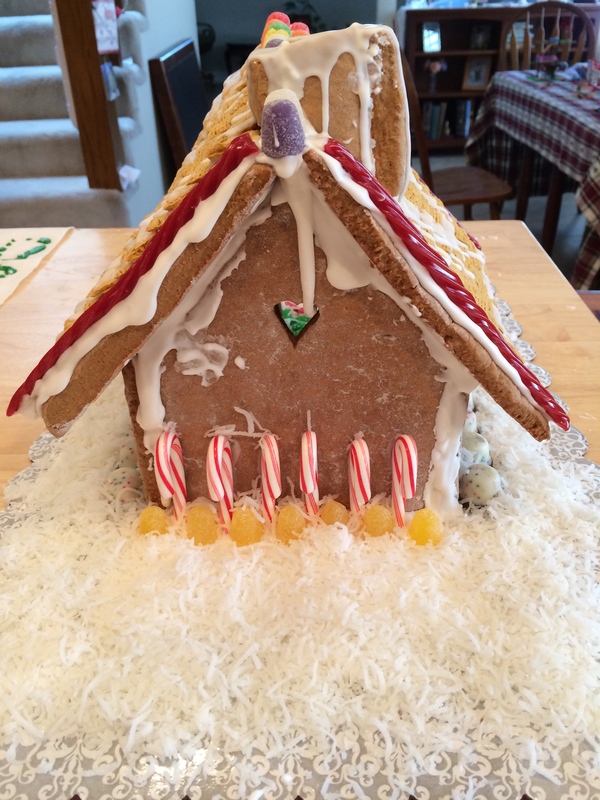 7. once cooled, decorate. I used Betty Crocker Cookie Icing. I’ve had lots of things to write about recently but not a lot of time, so here’s a brief recap of what we have been doing the past few weeks. All images are in the gallery in the Autumn Fun album. My co-worker Melissa had a birthday…she leaves the office at 3:30. Six of us descended upon her desk and wrapped literally everything in foil. Something tells me that before future birthdays, she’ll be working late. Melody and I learned how to make homemade applesauce. It’s super easy – 3 1/2 lbs apples peeled, cored & chopped; 1/4 cup water; 1 tbsp lemon or lime juice; 1 tbsp vanilla; cook in crock pot on low 4 hours. Mash for chunky applesauce. Gramma Alice, Melody and I went to Disneyland one Saturday and had a wonderful time! We went on the new Finding Nemo ride, the Autopia, the train, and so much more. We called it an early day so we wouldn’t all be too exhausted around 3:30. It was so much fun! My little superhero was Super Girl for Halloween. We trick or treated our own neighborhood for the first time and there were a lot of folks participating. Our next door neighbor Caelen (watch out Burke, she loves him!) had never actually been trick or treating, so it was a lot of fun to see the kids having so much fun together. This was the first year Melody seemed to really get it. And, she’s been obsessed with candy since. And you thought modern baking was time consuming? This is a fun little piece my mother passed on to me. First is an excerpt from Martha Washington’s letters to her grandmother. Note, I have written these exactly as they are printed, with the exception of using the modern “s” in place of the Georgian f shaped s to make it easier to read. Now, if you can find a pan big enough to bake this cake, you may want to ice it, right? Below is an excerpt from The Art of Cookery Made Plain and Easy by Hannah Glasse.